Since winning the silver medal at the 2000 Frederic Chopin Competition in Warsaw, Ingrid Fliter has built a reputation as a first-rate Chopin interpreter. Fliter has previously recorded two all-Chopin discs - her interpretation of the complete Chopin Waltzes received several five star reviews and was named as the Telegraph's �CD of the Week' and Classic FM Magazine's �Editors Choice'. Chopin's Piano Concerto No.1 is a thoughtfully scored composition that allows the piano to shine. The Scottish Chamber Orchestra's beautifully delicate playing perfectly highlights Fliter's authoritative, yet expressive performance. Fliter carefully and skilfully showcases the range of tones in Chopin's Piano Concerto No.2, from the dramatic introductory chords at the opening of the first movement to the sweetly lyrical second movement where the Scottish Chamber Orchestra's woodwinds vie for centre stage. Fliter is a breath-taking performer whose performance of Chopin's commanding chords and lightening speed runs are effortless. Chopin's two piano concertos, composed early in his career just before he left his native Poland for France, are perennially popular with pianists and audiences, but have come in for their fair share of criticism from academics over the years. These are not works that sit in the 'mainstream' development of the symphonic concerto from Mozart and Beethoven via Schumann to Brahms; instead they show the influence of such early nineteenth-century composer-pianists as Field, Moscheles, Kalkbrenner and, in particular, Hummel, whom the young Chopin met in 1828. Rather than the pianist and orchestra engaging in formally meaningful dialogue, these are works in which the orchestra for much of the time simply provides a backdrop to pianistic virtuosity and poetic decoration, and they are certainly best enjoyed and preformed when this is taken into consideration, not measuring them against inflated ideals with which they have little in common. 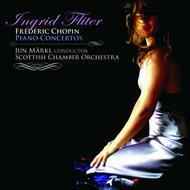 Happily, the Argentinian pianist Ingrid Fliter understands this music to a tee, and these delightful new recordings with the Scottish Chamber Orchestra under Jun M�rkl positively brim over with heartfelt musicality and emotional sincerity. Fliter's earlier recordings of Chopin's solo piano works for EMI were widely hailed for her extraordinarily idiomatic way with the composer's music, and that same depth of identification is evident throughout this disc too. Fliter's pianism is enormously engaging, bringing out the finest nuances of Chopin's filigree writing, technically adroit but never flashy, alive to both the heady Polish flavour of much of the music and its expressive poetry. In the E minor Concerto (actually composed second in the spring and summer of 1830, but numbered First as it was published before its sister work), she gives an account of the opening Allegro maestoso that is by turns imposing and winsome, with an astonishingly varied touch, and sterling support from the orchestra. In the central Romanze, Fliter's duets with the SCO's principal bassoonist, Peter Whelan, are a real peach, while the rondo finale, with its echoes of the Polish krakowiak dance, is wonderfully buoyant. The F minor Concerto (published as No. 2, but composed in 1829�30 before its companion) is every bit as good, the first movement tinged with nostalgia and traces of Schumann, and the soloist's entry in octaves is crystalline in its clarity, a truly arresting moment. The Larghetto slow movement, with its dramatic, almost operatic central section, was inspired by Chopin's love for a fellow student, the singer Konstancja Gładowska. Fliter's performance here combines intensity with transparency, an object lesson in how this music should be played. The mazurka-like finale has a marvellously wistful air about it, and the joyous closing pages are perfectly poised. If you think you know these works already, think again: these are revelatory performances, superbly sensitive and animated, and with magical support and transparent textures from the SCO. There's a detailed and extremely useful essay by Michael Quinn, and the recording (made in Edinburgh's Usher Hall) is as accomplished and natural as one expects from Linn. This disc easily makes it to the top of the pile in these much-recorded works, giving them a new lease of life and an extraordinary freshness.